A couple of years ago, our family started hosting a cookie decorating party for the kids and their friends the Saturday before Christmas. I’d planned to do the same again this year. However, between Christmas shopping, traveling, holiday parties and everything else, everyone’s December ends up pretty full. So I thought, why not have a party to-go? Box up all the fun stuff about a cookie decorating party and make it easy for the kids and their friends to use on their own! Turns out, the Santa’s Cookie Decorating Kit is a fun way to get children in the holiday spirit. The best part is they can use it whenever or wherever they’d like. 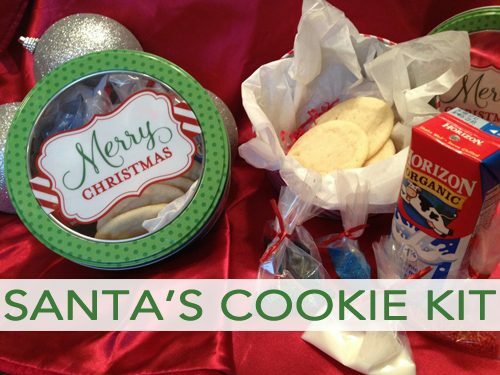 Add the Santa’s Cookie Kit printable, and spread some holiday cheer! Click here to download or print the Santa’s Cookie Kit printable.